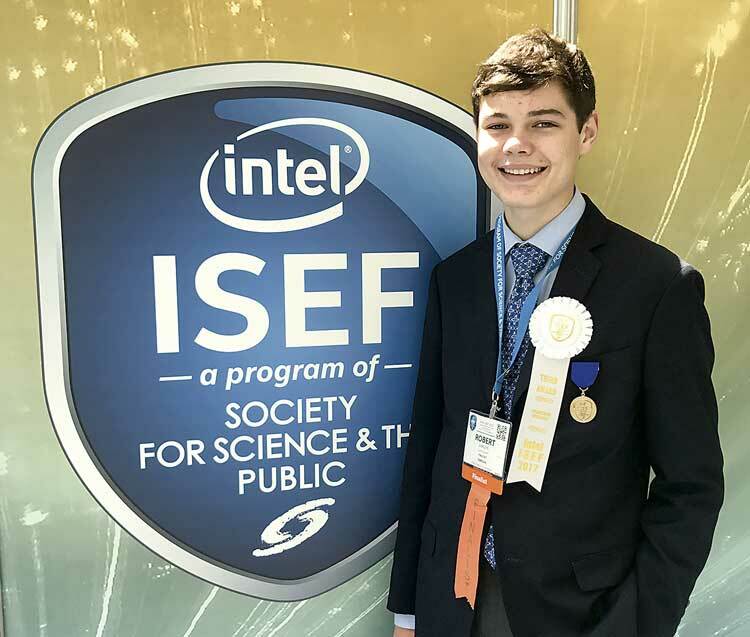 McIntosh High School student Robbie Van Zyl received a third place award in the Intel International Science and Engineering Fair (ISEF). It was Van Zyl’s first time at the event. “It was his first trip to the Intel International Science and Engineering Fair, the world’s largest pre-college science competition, but that did not stop McIntosh High School student Robbie Van Zyl from wowing the judges and bringing home a top award,” said school system spokesperson Melinda Berry-Dreisbach. Van Zyl’s project, “Can Machines Learn to Design Better than Humans,” won third place in the engineering mechanics category, and netted him a $1,000 award. He was among eight finalists at the fair to receive a third place award in this category, Berry-Dreisbach said. The project tested whether artificial intelligence (AI) could be used to train machines how to design better than expert humans. Berry-Dreisbach said Van Zyl competed against high school students from throughout the United States and countries around the globe. Out of the eight third place winners in the engineering mechanics category, four were from the United States, two were from Sweden and two were from the United Kingdom. “More than 1,700 young scientists, engineers and mathematicians participated in the 2017 Intel ISEF. Of these young innovators, Robbie was among the more than 400 competitors receiving awards and prizes for innovative research presented at the competition,” said Berry-Dreisbach. Van Zyl was selected to participate in the Intel ISEF after taking top honors at the 2017 Griffin RESA Regional Science and Engineering Fair.